The mark of a great ship handler is never getting into situations that require great ship handling. I am so much in love with this quote by Ernest King. Ship handling is both a science and an art. Science because it requires knowledge of various forces acting on the ship. Art because it requires the skills of an experienced navigator to use these forces in his favour. We may learn the science part from the various ship handling courses. But the art can only be learned from experience. Art has many forms. Art of ship handling also has many forms. Each navigator handles the ship in his own way and so far it does not go against the general good practices, each one of it is correct. So how can someone become a good ship handler. Or if I may say so, how can someone not be in a situation that would require great ship handling ? It can only be achieved by knowledge. It can only be achieved by learning both, the science and art of ship handling. I value the importance of all the terms related to ship handling. But when it comes to understanding these terms, I always prefer it to be in layman’s words. Today, let us talk ship handling in layman’s language. Talking in the same breath, let me ask a question. Why exactly one need to learn ship handling ? What are the things one would wish to use the ship handling for ? In this post, I will share few of the tricks (art and science) of ship handling so that you are able to do all of this. Whenever I studied ship handling, I always asked this question to myself. Can I move a ship in any direction while keeping the same heading ? If I can, what else do I need to know about ship handling ? 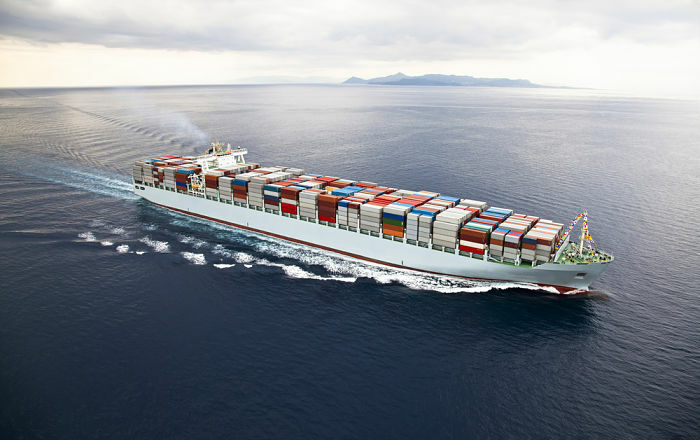 After all Ship handling means making the ship move in the direction we want and when we want. So do you want to know how we can move the ship in any of these direction. Before we proceed, I assume you know how the resultant of two or more forces acting in different direction works. If you want to know more on it, you can read it here or here. Or else you can watch this video. 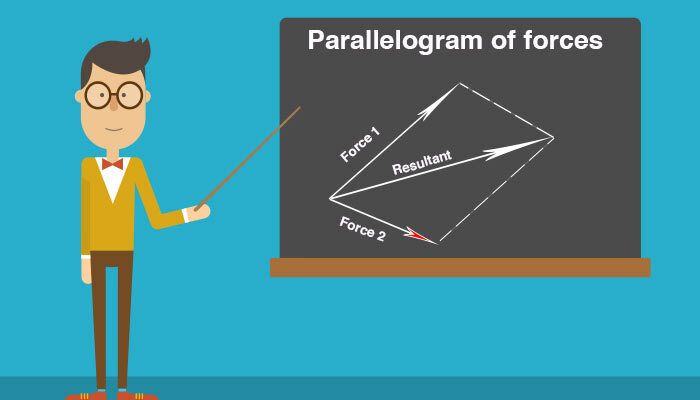 If two forces whose lines of action meet at a point are represented in magnitude and direction by the sides of a parallelogram drawn from one of its angular points, their resultant is represented in magnitude and direction by the diagonal drawn from that angular point. So what all forces a ship can experience while she is at sea ? Current and Wind are two of the most common forces. We should take these to our advantage. But there is one force that we can use to our advantage. That is the force of resistance from the water itself. Say the ship is moving at dead slow ahead. And I turn the rudder on the port side. Will the ship start turning right away ? No it won’t. Because depending upon the under water area of the hull, there is huge resistance offered from the water. The water acts as something like a wall to the underwater hull. The hull need to over power this resistance for it to start turning. This is also the reason why loaded ship start turning late when we give rudder order. But how can we use this resistance to our advantage ? Using this water resistance, we can actually move the vessel in any direction we want. Let us see it with an example. 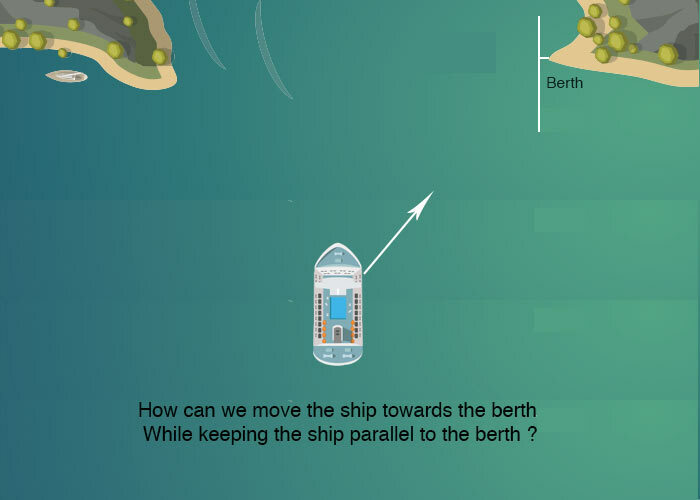 Let us say we want to move the ship towards the berth while keeping the heading of the vessel parallel to the berth. For berthing in this situation, one school of thought teaches us to berth in this way. For berthing to port side alongside, head to the berth with an angle of around 20 deg with the berth. Few meters from the berth, go astern. For right hand, fixed pitch propeller, this will turn the ship slightly to starboard because of transverse thrust. This will make the ship parallel to the berth. This method have some dangers associated with it. For example transverse thrust may not be as much as you expected. 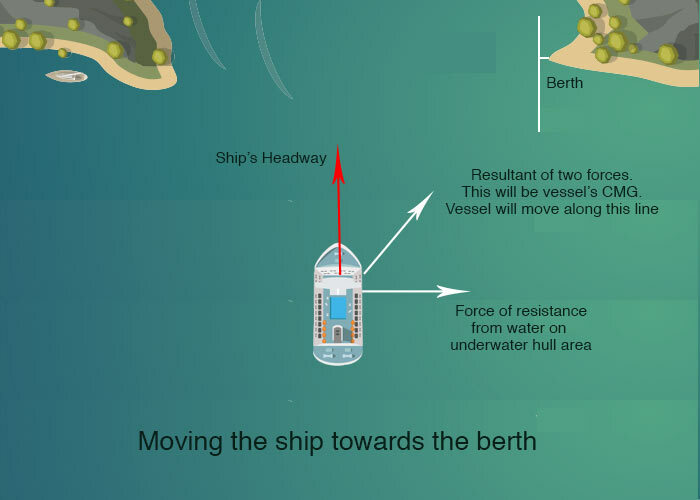 What if We use the forward headway vector and resistance force of water to have a resultant vector that will take the ship towards the berth. This is how it is done. Maintain a low forward speed (say around 3 knots). Now put the rudder on 10 Deg port. 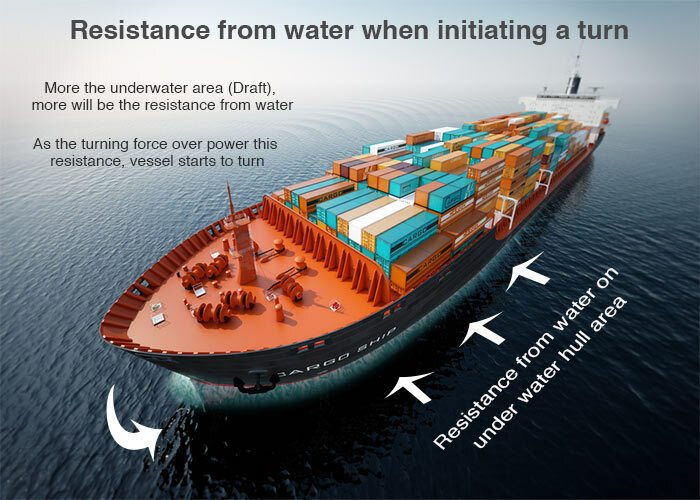 While the rudder is on 10 Deg port, vessel would experience the resistance on the underwater hull area. This resistance will try to push the vessel on the other side. Keep an eye on the rate of turn indicator as we will not allow the ship to turn. Before vessel starts to turn, put the rudder to midship. 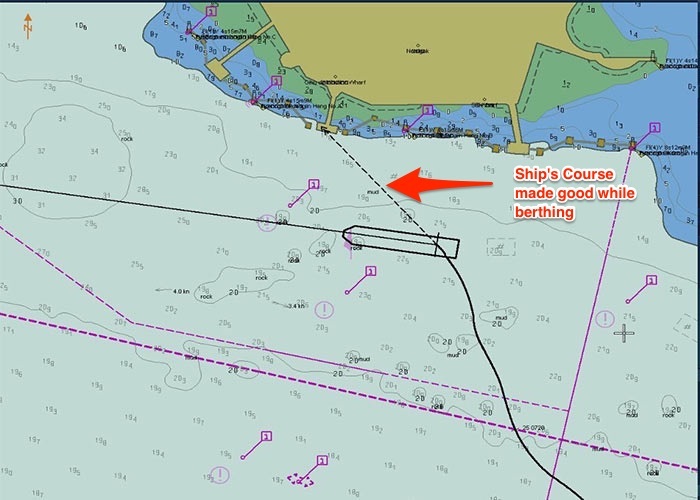 The resultant of vessel’s headway and the resistance we created will make the ship move towards the berth. We can adjust these two vectors to move the ship in a direction we want. For example we can reduce the speed if we want to have the resultant more toward abeam. Or we can increase the speed a bit to have the resultant vector more forward of beam. Or we can also increase or decrease the resistance force by varying the rudder order (say between 5 deg-15 Deg). Still do not believe that the we can use the water resistance to our advantage ? Then see this image taken during actual berthing of the vessel. By varying the strength of these two forces, we can move the ship in any direction we want. Apart from this, there are number of ways we can use this resistance in our favour. For example, let us say we are waiting for the pilot to board in a busy traffic area with engine stopped. 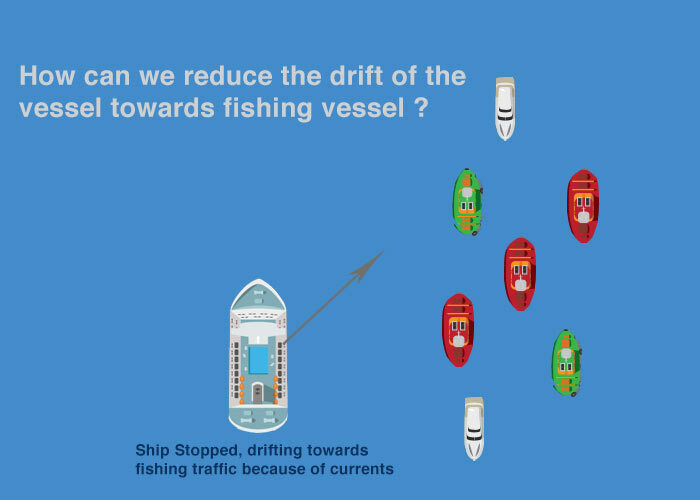 If the vessel is drifting towards fishing vessels or other anchored vessels, what can we do to reduce this drift. Again we can use the engine to dead slow ahead and put the rudder on hard to starboard. Before the vessel start to turn, stop the engine and rudder amidship. 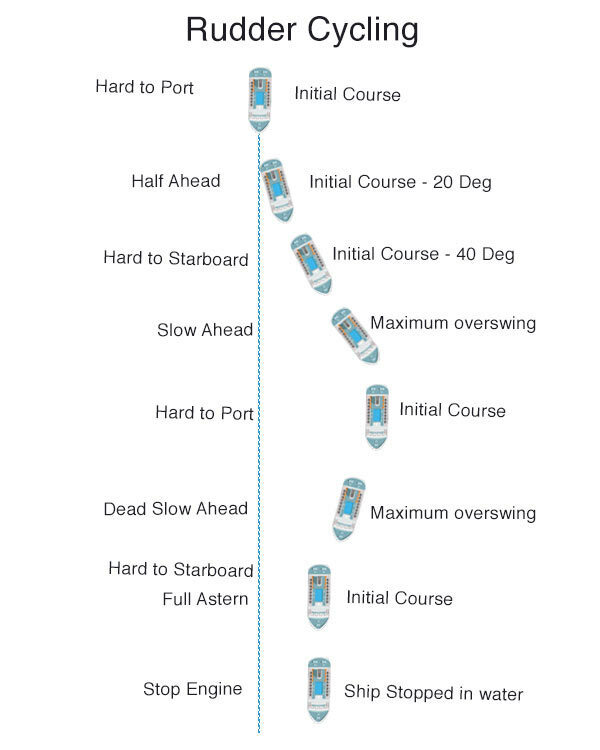 The Direction of vessel’s drift will change towards the vessel’s heading. We can use this resistance in many ways, only limitation being your imagination. Do you think we should keep anchor party standby forward when the vessel is moving at full manoeuvring ahead in a river ? I mean, what if they are stand by in the accommodation area with walkie talkie ? In emergency, by the time we reduce the speed to the level where we can drop anchor, the crew would definitely reach forward. This thought is based upon the assumption that even in emergency we cannot drop anchor when the ship moving at full ahead. Do you agree ? If you agree, you would be wrong. We can drop the anchor in emergency even when ship is moving at full ahead. Only thing is we need to follow the right steps in doing so. Want to know how we can achieve that ? Imagine that vessel is moving at 12 knots in a river with engine full ahead. For some reason we need to stop the vessel immediately. Put the rudder hard over to the side you can turn the ship. Drop the anchor to the side of the turn. So if you are turning to starboard, drop starboard anchor. Before we drop anchor we must ensure that we are dropping the anchor in an area of suitable anchoring depths. Turning would reduce the vessel’s speed. As the speed of the ship reduces, keep on going down on the engine movement too. For example, let us say half ahead speed is 10 Knots and slow ahead speed is 7 knots. When we have dropped the anchor and start turning, bring the engine to half ahead. When the speed is just over 10 knots (say 11 knots), bring the engine to slow ahead. When the speed is just over 7 knots (say 8 knots), bring the engine to dead slow ahead. Whenever you can, stop the engine. We need to be careful with stopping the engine as when we stop the engine, vessel’s rate of turn would reduce and anchor chain might get stressed. While we have initiated this procedure, the instructions to the anchor party would be to keep pay out the cable as the weight comes. Their goal would be to not to stress the cable too much and hold the anchor until weight comes on the cable. But the question is, won’t the anchor damage in this case ? The answer would be No. When the vessel starts to turn, it will cover distance equal to head reach in forward direction and side reach in athwartship direction. In fact because of controlled load on the anchor, its maximum head reach and side reach will reduce. The length of the anchor chain would be sufficient to stretch to this distance. In fact you may not need to pay the entire length of the anchor chain. If you get a chance, try this exercise on the simulator to believe it. Imagine we are moving at some speed to approach a port and suddenly we are asked to wait for the pilot. This is a common situation Masters are subjected to at many ports. We wish we had some kind of brakes on the ship, which we could just press to stop the ship or reduce the speed. But we do not have brakes on ship, right ? But wait, who said ship does not have brakes to stop the ship ? Rudder cycling is most effective way to stop a ship without changing the heading. It uses the resistance of water on underwater hull area to reduce the speed of the ship. When the ship’s heading returned to original course, put the rudder on hard to starboard to check some of the port swing. This will stop the ship at considerable lesser distance. But we do not need to use rudder cycling only to stop the ship. We can also use the rudder cycling when we need to reduce the speed of the ship. Can you think of a situation when we need to turn the ship at its position ? 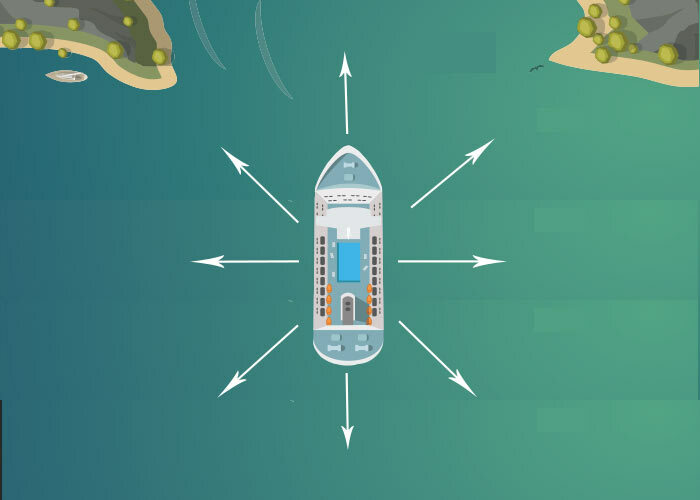 We may need to turn the ship near to the berth when we arrive at the berth from down river direction and we need to berth facing upriver direction. But turning in this situation may not be that tricky as we can use the tugs to turn the vessel. Now consider a situation where you have anchored in a very congested anchorage and you need to pick up the anchor and turn the vessel. 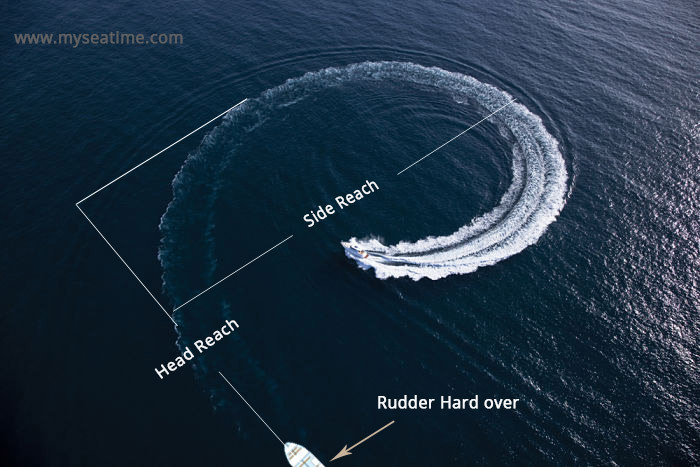 In this situation if you have bow thruster fitted, it is easier to turn the vessel. But how to turn the vessel at its position if you do not have bow thruster. For right hand fixed pitch propellers, it is always easier to turn the ship on starboard side. Wheel hard to starboard and give a quick burst ahead on the engines. Ship will start to turn to starboard. Do not gather too much ahead speed. Just about when speed is around 0.5 Knots, stop the engine. Wheel amidship, give a quick burst astern on the engine. As the engine goes to stern, the bow will start to move to starboard. This will help the starboard turn as well as reduce the forward speed of the ship. As the ship gains some sternway (around 0.5 knots), stop the engine. Repeat the above steps and keep the vessel turning to starboard. Ship handling cannot be learned in few days or few months. Apart from learning the theory of Ship handling, we also need to practice it on board to be master of it. Ship handling need to be learned right from the time on junior ranks. We need to observe how Masters and pilots handles the ship. If they ordered the rudder to port 10 deg, why did they do so ? If they used the engine in astern direction, why did they do it now ? Asking these question and then finding the answers right from the junior ranks can make us a better ship handler. Rajeev, good afternoon. Thanks for the tricks, to start with. Otherwise, a couple of considerations to share. The ship is, normally, a "she", and not an "it". She is a living creature and the animated one. Another thing to share is the following expression: "A superior seaman uses his superior judgement to keep out of situations requiring his superior skills". Tks again & brgds. Nikolai. 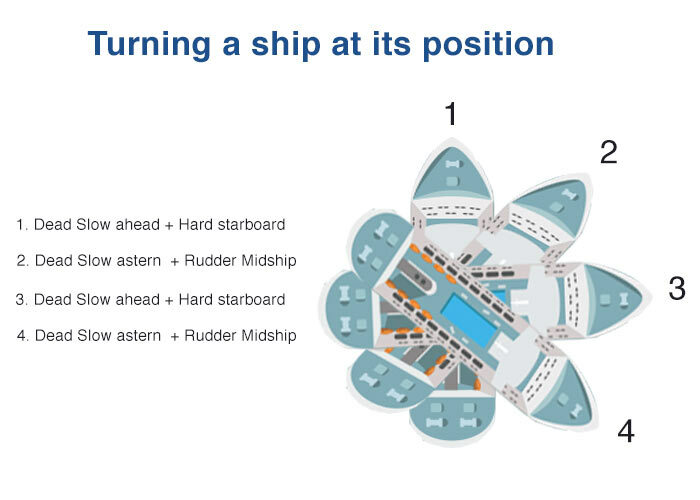 The information is well presented however, some ilustrations do not coincide with the explanation when refering to vessel berthing port side.